Date opened: 1.4.1884 for the general public; previously restricted use. On the west side of Saffron Road (B5366) at the north-western corner of South Wigston. Present state: All evidence of the station buildings and platforms has been removed, although the original access road to the down platform goods siding is still used for track maintenance. The line between Leicester and Nuneaton remains open for passenger and freight traffic. main line from Wigston for the last four miles into the city. In return, the MR had reciprocal running rights on the SLR to Hinckley and Nuneaton. In their original plans, the SLR did not consider having a station at Wigston, probably because there was no community to serve in that area. In 1867 the London & North Western Railway (LNWR), who had been a major shareholder in the SLR, acquired the railway outright. The situation changed in 1881 when a new barrack complex was built at Glen Parva for the Leicestershire Regiment. The site was adjacent to the LNWR line where it passed under the Saffron Road. It is possible that the War Office approached the LNWR with a request to provide a station for the use of the army, both for official military traffic and off-duty personnel. In response, the LNWR opened Glen Parva station in 1882. Initially it was intended for the sole use of the military, but the growing civilian community of South Wigston very quickly saw the travel opportunities that the station offered, particularly for journeys to Hinckley and Birmingham. 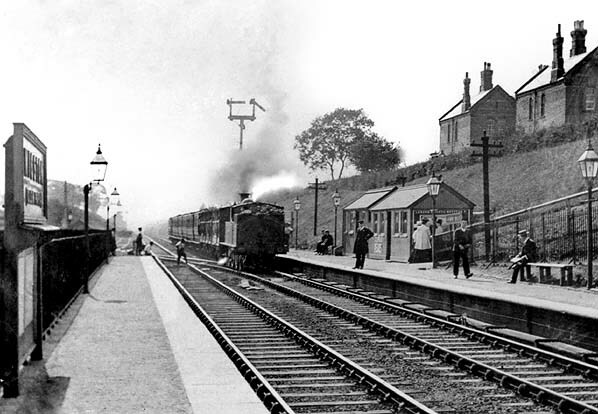 This new demand persuaded the LNWR to open Glen Parva station to general traffic on 1 April 1884. Very soon after, the station name was changed to Glen Parva for Wigston, and in September1887 it became Wigston Glen Parva. at road level, with a path leading down to the up platform. A similar, but smaller, building was erected on this platform for use as a waiting room, and in 1904 this was expanded to include a separate waiting room for ladies. The down platform was given a separate flight of steps for access in 1892, but appears to have been devoid of any cover for passengers until 1913 when another prefabricated building was erected on this side. A short goods siding was put in by the LNWR immediately behind the down platform, and this was also connected to a spur that came off the down line and entered a quarry where clay was extracted for the local brickworks. When this works closed early in the 20th century, the spur continued to serve a pre-cast concrete company and was also used for general goods deliveries for the local area. 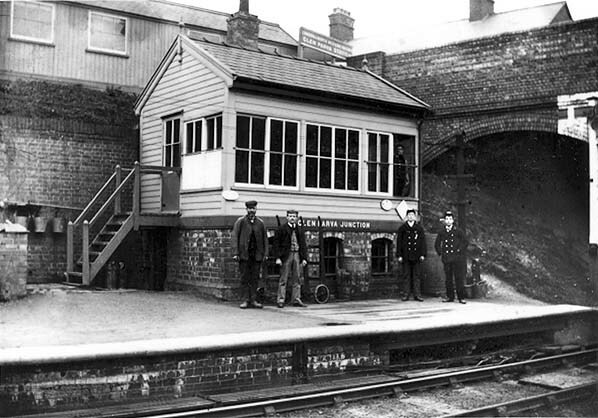 The LNWR built a signal box at the east end of the up platform. 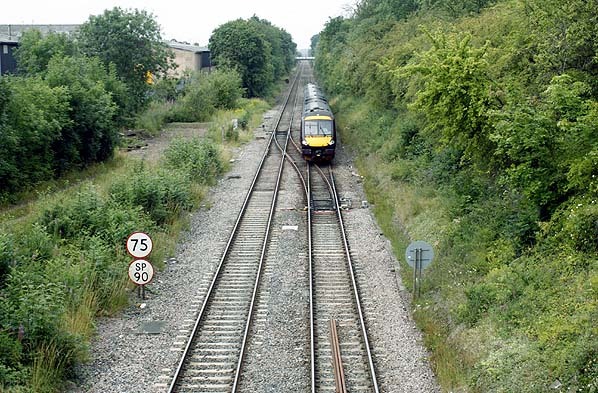 Named Glen Parva Junction, it not only controlled the crossover to the siding and quarry, but also the nearby junction with the south curve line to the MR main line at Wigston (L&H) station. Wigston Glen Parva station was gas-lit, and in the late 1950s totem name signs were installed. All three of Wigston’s stations were listed for closure in the Reshaping of British Railways (‘Beeching’) report. The formal closure procedure for Wigston Magna (and most of the intermediate stations between Birmingham New Street, Leicester London Road and Nottingham Midland) began on 2 October 1964, and on 16 August 1967 the Minister of Transport announced her decision to close the station: this took place on 4 March 1968. 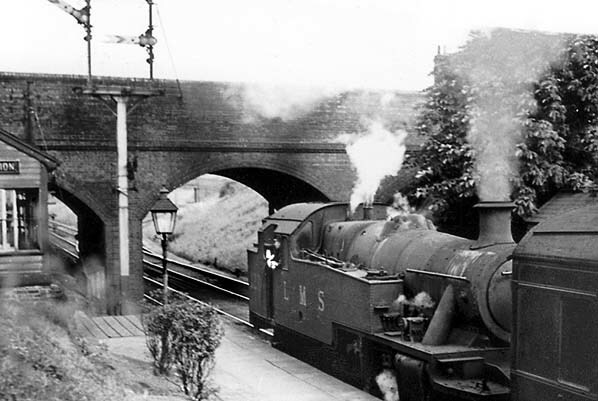 Wigston Glen Parva had already closed to goods traffic on 4 July 1966. 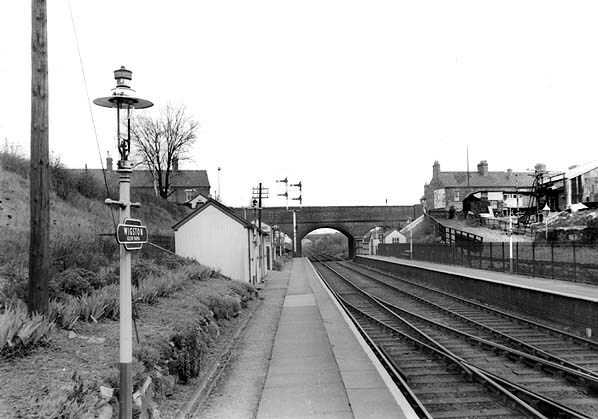 Although the station buildings and platforms were removed soon after the end of passenger services, the signal box (Glen Parva Junction) situated at the east end of the up platform remained in use for a number of years. 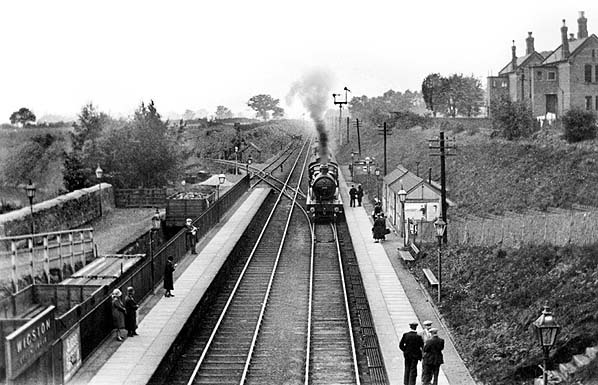 Within a decade of its closure there was demand for a new local railway station to serve the growing suburb of South Wigston. With a grant from the County Council, an unstaffed station, called South Wigston, was constructed about three hundred yards east of the old Wigston Glen Parva station. It opened on 10 May 1986 to be served by trains at peak times. Further reading: Leicestershire's stations by Andrew Moore (Laurel House 1998). 1886 1:2,500 OS map four years after Glen Parva station (note the original name) opened. The single goods siding is seen running behind the down platform. The spur to the brickworks was under construction at this time. 1914 1:2,500 OS map. Although the station was renamed Wigston Glen Parva in 1887, the original name is still shown here. The brickworks spur now also serves an extended goods yard with a goods shed, weighbridge and crane (5-ton) all shown. 1955 1,2,500 OS map. The brick works has been replaced with a cement works, still rail-served. The station is now shown correctly as Wigston Glen Parva. 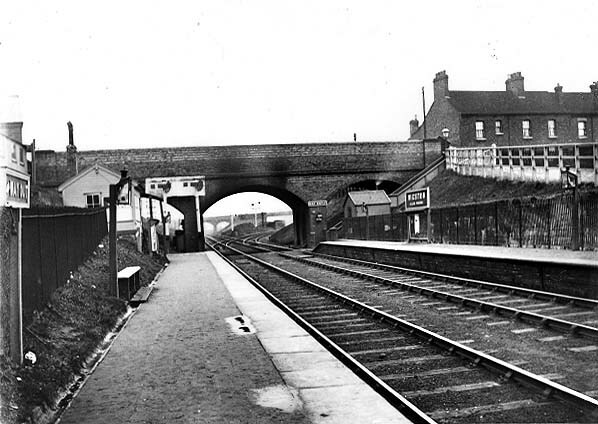 Wigston Glen Parva station, looking east from the up platform c.1900. Access to the down platform was by steps seen to the right of the bridge. The slope led to the goods dock. 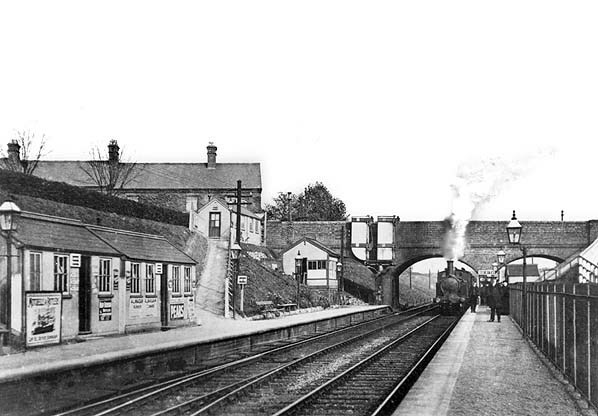 The 'down' platform looking west, as a local LNWR train approaches c.1905. A view from the same platform but in the opposite direction, as a return LNWR working from Leicester stops to pick up passengers. The ticket office is seen at street level at the top of the slope. c.1905. Looking west from the road overbridge towards Nuneaton and Birmingham. In this LMS (c.1930) era photograph, the army barrack buildings can be seen on the right. The original single goods siding is seen behind the down platform. The spur to the brick works and the later goods yard is seen beyond the platform. 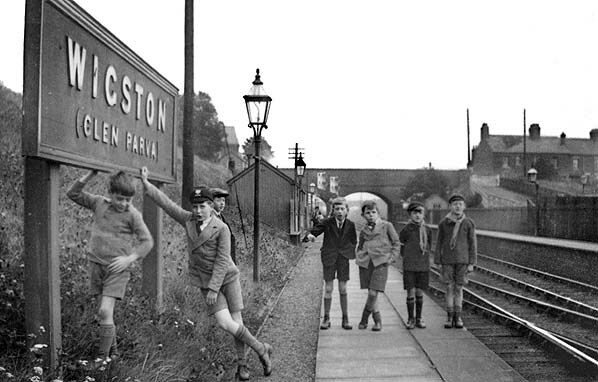 Local children at play on the up platform at Wigston Glen Parva station c.1930s. A scene in the final days of the LMS era just prior to the nationalisation of the railways. A local stopping train receives 'the peg' for a departure to Leicester. Looking towards Leicester from the 'up' platform in 1961. 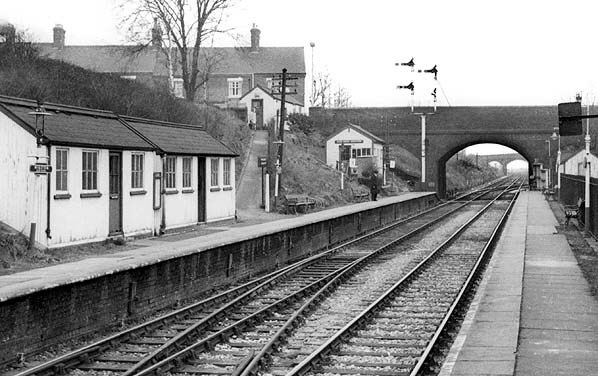 Wigston Glen Parva station, looking east from the down platform just before closure in 1968. The site of Wigston Glen Parva station in July 2011 Very little evidence remains, although the road access to the former siding on the left and the path retaining wall down to the platform on the right are still just visible. Compare this to the 1930s picture above.